"I fear you do not fully comprehend the danger of abridging the liberties of the people. Nothing but the sternest necessity can ever justify it. A government had better go to the extreme of toleration than to do aught that could be construed into an interference with, or to jeopardise in any degree, the common rights of its citizens." I've been seeing this Abe Lincoln quote a lot recently. Andrew Sullivan used it recently to book-end a column in the London Times defending those who stand up for civil rights, and condemn torture, in the war on Islamist terrorism. I think he's right, of course, but I also have noticed that polemicists who enlist historical figures in their crusades often make ill-advised choices. The quote Sullivan uses is a lovely and forceful statement. 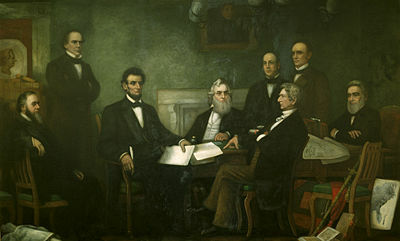 Its source is the artist Francis Bicknell Carpenter (1830-1900), who from February through July 1864 worked at the White House painting "First Reading of the Emancipation Proclamation before Lincoln's Cabinet." Carpenter was hardly an impartial observer, being a passionate abolitionist. He put the Lincoln quote into a book he wrote, "The Inner Life of Abraham Lincoln: Six Months at the White House." I've never seen a historian cast doubt on the quote, but it is relevant to note it's anecdotal, not from Lincoln's writings. Oh, I believe he may have said something like that, in response to a fire-eating unionist, in the early months of 1864, with the mid-term elections safely over and the presidential campaign not yet begun, with the crisis of emancipation past and the draft riots quelled. He could afford to speak that way, and it would be like him to pose as a leader carefully navigating a moderate path through the shoals of crisis. Always, Lincoln knew, there were men and women in the North who would have pursued a policy that would have been fatally radical and aggressive. Lincoln was savvy enough not only to keep their hands off the tiller, but to use them as a public foil, to put the shine on his image as a sober, sane leader. It seems he could manage this trick whether they were congressional leaders or ladies at a levee. But at the time he is alleged to have said this, his administration already had once shut down the offending newspaper. It had shut down many others, too, despite the existing machinery of government censorship. Telegraph wires out of Washington, which the major daily newspapers relied on for their news of the war and the government, were subject to State Department censorship. On account of the repeated expression of disloyal and incendiary sentiments, the publication of the newspaper known as the Chicago Times is hereby suppressed. Brig. Gen. Jacob Ammen, commanding the District of Illinois, was charged with the execution of this order, and under his authority the captain in command at Camp Douglas, Chicago, warned the newspaper's management they must not publish again, under penalty of military seizure. Generals in uniform often lacked the patience and philosophy to distinguish between treason or material support of the rebellion, on the one hand, and lawful criticism of civil and military acts of the government, on the other. As a result, military authorities in the North often carried out presidential directives more heavy-handedly than Lincoln and his cabinet intended. Or at least the Administration found it convenient to present matters as such. I have received additional despatches, which, with former ones, induce me to believe we should revoke or suspend the order suspending the Chicago 'Times'; and if you concur in opinion, please have it done. In regard to the order of General Burnside suspending the Chicago "Times," now nearly a year ago, I can only say I was embarrassed with the question between what was due to the military service on the one hand, and the liberty of the press on the other, ... I am far from certain today that the revocation was not right. Using embarrassed here in the older sense of "perplexed, thrown into doubt." It was a small epsiode in a thick book. Under cover of a congressional act of Aug. 6, 1861, authorizing the President to direct the seizure of anyone who was "aiding, or abetting, or promoting ... insurrection," the Lincoln government had begun shutting down the opposition press. Court martials were authorized in the cases of newspapers that printed information considered to have aided the enemy. Ten days after the bill passed, charges of disloyalty for alleged pro-Southernism had been brought in United States Circuit Court against the "New York Journal of Commerce," "Daily News," "Day Book," "Freeman's Journal," and the "Brooklyn Eagle." On August 21 the federal government ordered that copies of the New York newspapers that had been suppressed should not be carried by the mails. Suppressions continued August 22 in New York, New York; Canton, Ohio; and Philadelphia. On September 18 the Louisville, Kentucky "Courier" was banned from the mails, and its offices were seized the next day by federal authorities. Not long after the Lincoln speech on freedom of opinion that Carpenter reported, and the now-widely cited quote about "extreme of toleration," another newspaper got into hot water with the administration. This time, Lincoln went directly and personally to the military authorities to shut it down. In May, the battles began again, this time with Grant in charge in the East, and the casualty list of dead and wounded skyrocketed. The North fought to bloody stalemates in the Wilderness and at Spotsylvania, and saw terrible waste of lives in the botched Bermuda Hundred campaign. Whereas, there has been wickedly and traitorously printed and published this morning, in the New York World and the New York Journal of Commerce, ... a false and spurious proclamation purported to be signed by the President ... which publication is of a treasonable nature, designed to give aid and comfort to the enemies of the United States and to the rebels now at war against the Government and their aiders and abettors, you are therefore hereby commanded forthwith to arrest and imprison ... the editors, proprietors and publishers of the aforesaid newspapers, and all such persons as, after public notice has been given of the falsehood of said publication, print and publish the same with intent to give aid and comfort to the enemy; and you will hold the persons so arrested in close custody until they can be brought to trial before a military commission for their offense. You will also take possession by military force, of the printing establishments of the New York World and Journal of Commerce, and hold the same until further orders, and prohibit any further publication therefrom. Dix took newspaper managers into custody. He seized the newspaper offices and held them under military guard for three days. The "extreme of toleration" quote is an unusual one in Lincoln's corpus. Because during the war Lincoln more often turned his eloquence to justifying civil repressions than to condemning them. For instance, he wrote in June 1863 to Erastus Corning and others in New York state who had petitioned against Lincoln's trampling of civil liberties in the name of war for the Union. Lincoln took the petition as an opportunity to reply with a public letter explaining his view of these things. ... [H]e who dissuades one man from volunteering, or induces one soldier to desert, weakens the Union cause as much as he who kills a Union soldier in battle. Yet this dissuasion or inducement may be so conducted as to be no defined crime of which any civil court would take cognizance. Nor am I able to appreciate the danger ... that the American people will, by means of military arrests during the rebellion, lose the right of public discussion, the liberty of speech and the press, the law of evidence, trial by jury, and Habeas corpus, throughout the indefinite peaceful future which I trust lies before them, any more than I am able to believe that a man could contract so strong an appetite for emetics during temporary illness, as to persist in feeding upon them through the remainder of his healthful life. [Southern] sympathizers pervaded all departments of the Government and nearly all communities of the people. From this material, under cover of 'liberty of speech,' 'liberty of the press,' and 'habeas corpus,' they hoped to keep on foot among us a most efficient corps of spies, informers, suppliers, and aiders and abettors of their cause in a thousand ways. They knew that in times such as they were inaugurating, by the Constitution itself, the 'habeas corpus' might be suspended; but they also knew they had friends who would make a question as to who was to suspend it; meanwhile, their spies and others might remain at large to help their cause. Or, if, as has happened, the Executive should suspend the writ, without ruinous waste of time, instances of arresting innocent persons might occur, as are always likely to occur in such cases; and then a clamour could be raised in regard to this, which might be, at least, of some service to the insurgent cause. It needed no very keen perception to discover this part of the enemy's programme, so soon as, by open hostilities, their machinery was fairly put in motion. Yet, thoroughly imbued with a reverence for the guaranteed rights of individuals, I was slow to adopt the strong measures which by degrees I had been forced to regard as being within the exceptions of the Constitution, and as indispensible to the public safety." Of how little value the constitutional provisions I have quoted will be rendered, if arrests shall never be made until defined crimes shall have been committed, may be illustrated by a few notable examples. Gen. John C. Breckenridge, Gen. Robert E. Lee, Gen. Joseph E. Johnston, Gen. John B. Magruder, Gen. William B. Preston, Gen. Simon B. Buckner, and Commodore Franklin Buchanan, now occupying the very highest places in the Rebel war service, were all within the power of the Government since the Rebellion began, and were nearly as well known to be traitors then as now. Unquestionably if we had seized and held them, the insurgent cause would be much weaker. But no one of them had then committed any crime defined in the law. Every one of them, if arrested, would have been discharged on habeas corpus were the writ allowed to operate. In view of these and similar cases, I think the time not unlikely to come when I shall be blamed for having made too few arrests rather than too many. Long experience has shown that armies can not be maintained unless desertion shall be punished by the severe penalty of death. The case requires, and the law and the constitution, sanction this punishment. Must I shoot a simple-minded soldier boy who deserts, while I must not touch a hair of a wiley agitator who induces him to desert? This is none the less injurious when effected by getting a father, or brother, or friend, into a public meeting, and there working upon his feeling, till he is persuaded to write the soldier boy, that he is fighting in a bad cause, for a wicked administration of a contemptable government, too weak to arrest and punish him if he shall desert. I think that in such a case, to silence the agitator, and save the boy, is not only constitutional, but, withal, a great mercy. In giving the resolutions that earnest consideration which you request of me, I can not overlook the fact that the meeting speak as "Democrats." Nor can I, with full respect for their known intelligence, and the fairly presumed deliberation with which they prepared their resolutions, be permitted to suppose that this occurred by accident, or in any way other than that they preferred to designate themselves "democrats" rather than "American citizens." In this time of national peril I would have preferred to meet you upon a level one step higher than any party platform; because I am sure that from such more elevated position, we could do better battle for the country we all love, than we possibly can from those lower ones, where from the force of habit, the prejudices of the past, and selfish hopes of the future, we are sure to expend much of our ingenuity and strength, in finding fault with, and aiming blows at each other. But since you have denied me this, I will yet be thankful, for the country's sake, that not all democrats have done so. Truly, the letter to Corning is one of the great pieces of political writing in American history -- and one of the most nefarious. Like Bush in 2001, Lincoln in 1861 faced a legal fog in defining his enemy, and delineating his war. Even among many people in the North, the power of a state to secede from the union was held to be a legal right. The Constitution, as read by many, was seen as silent, or ambiguous, on the issue. A range of positions could be defended. Buchanan's attorney general (a loyal Pennsylvanian), for instance, had investigated the laws and concluded that, while the secession was not legal, the government had no authority to stop it. Meanwhile, the seceded states formed themselves into a new nation. Lincoln's official position was that the Confederacy did not exist and that he was suppressing an internal rebellion. Yet in practice, he treated the South as a sovereign power. He blockaded its coast. His administration acknowledged its sea-rovers as privateers and not as pirates. When rebels invaded the North and were captured at Gettysburg they were treated as POWs, not as traitors to be hanged for treason, because they were commanded by officers holding commissions from the Confederate government. In fact, Lincoln made every attempt to have it both ways, because his powers, as president, were limited differently in each case. Whichever situation gave him what he needed, that is how he painted the war/rebellion in that case. He twisted a corkscrew path through the laws and the Constitution to extend his own powers as president to meet a new situation that the existing laws seemed, to him, insufficient to address. He did so to recruit and maintain a large standing army to fight a modern war, and in doing so he broke the Constitution he had sworn to uphold, which was structured to provide temporary, minute-man armies (in a system little changed since King Alfred's aldormen led the Anglo-Saxon fyrd to repel Viking marauders). He did so in sweeping aside civil rights, including habeas corpus, and filling Northern jails with men never charged with any crime. He did so in full knowledge that his nation was full of dissent, and his agents couldn't, or didn't care to, distinguish honest loyal opposition from active treason. "I can only say that if the authority under which the constitution has confided to the judicial department and judicial officers, may thus, upon any pretext or under any circumstances, be usurped by the military power, at its discretion, the people of the United States are no longer living under a government of laws but every citizen holds life, liberty and property at the will and pleasure of the army officer in whose military district he may happen to be found." Lincoln then wrote out a standing order for Taney's arrest. It was never served. But Merryman set the tone and left it to the justices to decide whether to provoke fights, legitimate or not, that they had no power to win. Military rule in the first year of the war was especially strong in Maryland, the slave state that stood between Washington, D.C., and the rest of the North. The Maryland legislature denounced "the present military occupation of Maryland" as a "flagrant violation of the Constitution." Secretary of State William Seward then ordered a lightning raid across the state that jailed 31 legislators, the marshal of the Baltimore City Police Force and the Board of Police Commissioners, the mayor of the city, a former Maryland governor, members of the House of Delegates from Baltimore City and County, the 4th District congressman, a state senator and newspaper editors (including Francis Scott Key's grandson). Ft. McHenry (of "Star Spangled Banner" fame) had a darker chapter in these days as the "Baltimore Bastille." Many of those arrested by federal officials were never charged with crimes and never received trials. In the fall, Lincoln arrested allegedly disloyal members of the state legislature (Sept. 12-17, 1861), to prevent them from attending a meeting that could have voted on secession. But Maryland was not really safely in the Union until the November state elections. Federal provost marshals stood guard at the polls and arrested known Democrats and any disunionist who attempted to vote. The special three-day furlough granted to Maryland troops in the Union army, so they could go home and vote, further tilted the election. The result, not surprisingly, was a solidly pro-Union legislature. The next year, state judges instructed grand jurors to inquire into the elections, but the judges were arrested and thrown into military prisons. In regard to the "Exchange" and other secessionist presses in that city. I presume you are not aware that an order for the suppression of these presses was made out in one of the Departments of Washington. ... I think a measure of so much gravity as the suppression of a newspaper by military force should carry with it the whole weight of the influence and authority of the Government especially when the publication is made almost under its eye. Reffered to General McClellan. I believe the "Exchange," "Republican" and "South" should be suppressed. They are open disunionists. The "Sun" is in sympathy but less diabolical. No secession flag has to the knowledge of the police been exhibited in Baltimore for many weeks, except a small paper flag displayed by a child from an upper window. It was immediately removed by [the police]. They have been instructed to arrest any person who makes a public demonstration by word or deed in favor of the Confederate Government and I have prohibited the exhibition in shop windows of rebel envelopes and music. Fort McHenry which has not sufficient space for the convenient accommodation of the number of men necessary to man its guns is crowded with prisoners. ... It is too near the seat of war which may possibly be extended to us. It is also too near a great town in which there are multitudes who sympathize with them who are constantly applying for interviews and who must be admitted with the hazard of becoming the media of improper communications, or who go away with the feeling that they have been harshly treated because they have been denied access to their friends. ... If as is supposed Fort Lafayette is crowded may they not be provided for at Fort Delaware? ... I certainly do not think them perfectly safe here considering the population by which they are surrounded and the opportunities for evading the vigilance of their guards. The arrest of W. Wilkins Glenn, the proprietor of the "Exchange," has given intense satisfaction. Beale Richardson and his writing editor Joice, of the "Republican," are very violent and would grace the Tortugas. If the exchange should go on a Doctor Palmer and a William H. Carpenter are the ostensible editors, and both write with bitterness. They too would do well at Tortugas. We are determined to prevent any rebel voting if he will not take the oath of allegiance. It is to be done by a system of challenging. The new mayor has already surrendered the pistols retained by the old police and evinces a reaidness to co-operate with the Federal authorities. His name is Blackburn. It is intimated that General Howard has taken the hint and will not accept the rebel nomination for Governor. If he does he should be sent at once to Fortress Monroe, and so too of Jarrett, the rebel nominee for comptroller. My belief is that the peace convention is defunct. Still I have taken measures to have them watched and will inform you promptly of any movement by them. I do not think it would be wise to cease making arrests entirely. Some evidence that the power is with the Government should be kept before the eyes of the discontented few. It has a most salutary effect. "The memoranda states in substance that -- All persons who have lately uttered expressions of hostility to the Government or have spoken disrespectfully of the President of the United States are to be arrested and detained in camp." You will ... please inform all the prisoners confined at Fort Warren that this Department will not recognize any person as an attorney in such cases, and that if the fact comes to the knowledge of the Department that any prisoner has agreed to pay to any attorney a sum of money or to give to him anything of value as a consideration for interceding for the release of such prisoner that fact will be held as an additional reason for continuing the confinement of such person. You will also please say to the prisoners that it is the wish of the Government that they should communicate whatever they may have to say directly to this Department. And on and on. On Sept. 24, 1862, after fresh military disasters, with a gloomy prospect for the administration in the upcoming elections, with an unpopular conscription looming and doubt about the public's reception of the Emancipation Proclamation, the President suspended habeas corpus again, this time over the entire North. The Maryland scenes were repeated on a national scale. Lincoln got a break when an important case came to Justice James M. Wayne, who was perhaps the staunchest war supporter on the Court. In U.S. v. Colonel Gorman Wayne upheld Lincoln's extra-legal (at best) recruiting drive in 1861 and its retroactive endorsement by Congress. "It is my opinion," Wayne ruled, "that Congress has constitutional power to legalize and confirm executive acts, proclamations, and orders done for the public good, although they were not, when done, authorized by any existing laws." Even some who supported the Northern cause blanched at this notion, but it was in keeping with the general spirit of the administration and the pro-war press, which was to "preserve the union at all costs." Lincoln used his presidency to pack the Supreme Court with justices who would be more sympathetic to his purposes. Three of five justices who sustained the administration in the important Prize case of 1863 were new Lincoln appointments. But the full question of whether the Constitution gave the president a special power to suspend the writ of habeas corpus during wartime never got to the Court. In large part that's because the administration made sure it didn't. It had a valid fear that the Court would rule against there being such a power under the Constitution, and such a ruling would undermine the war effort. On the other hand, by keeping the matter away from the Court, the administration could largely accomplish its policy. Opposition, especially in the press, clamored for a test case to settle whether the arbitrary arrests were legal. Secretary of War Stanton thought it would be wise to do so, too, but Attorney General Bates talked him out of it. In a letter of Jan. 31, 1863, Bates wrote to Stanton that a Supreme Court decision against the habeas corpus policy "would inflict upon the Administration a serious injury," and would do more good to the rebels "than the worst defeat our armies have yet sustained." Only after victory was secure, and only gradually and tentatively at first, did the Supreme Court begin to put the nation back on a Constitutional basis, which Lincoln and the Radicals in Congress had disrupted. Both Lincoln and Taney were dead by this time. Lincoln had done what was necessary to his purpose, which he saw as saving America's future, and he let the lawmakers catch up as they would. Or he left it to the courts to undo the power grabs long after they served their purpose. Some of them were never undone, and America after 1865 was never again ruled by the government that had been created in 1787. History forgives him these transgressions (though they are more bitterly remembered in the South) because the war he led America into had a great (if unintended) result of freeing slaves. It gave them an imperfect freedom, to be sure. The backlash brought explosive violence into their lives. And real civil rights didn't come their way for another century. Yet however imperfectly he did it, Lincoln defeated slavery -- an institution that had enjoyed the protection and support of the U.S. government until then. (Even so radical an anti-South man as Thad Stevens once took a case on behalf of a master reclaiming his runaway slave.) And history gives him that honor and Americans rank him among their greatest presidents. Our national system is not perfect, it's dynamic. When you push on the people's civil rights, they eventually push back. And the most dramatic advances in freedom have come after the most serious transgressions. Ever since the Zenger trial in 1735, American civil right have emerged stronger from every attempt to cramp them. Almost 200 years alter, John Scopes lost his "monkey" trial in Tennessee. But the trial itself turned the hearts of Americans. The authorities may bully, and they may have the strong arm, but eventually the case goes to court or the legislative chamber, and there the rights tend to win the day. As long as eloquence can come to their aid, personal liberties will triumph. The outcome of a particular case is no matter. Our love of liberty triumphs, in a Hollywood ending, over our yearning for order and the fear of the strange. But the wrongs that never seem to be undone in the courts are those that increase the power of the federal government, and especially the executive. 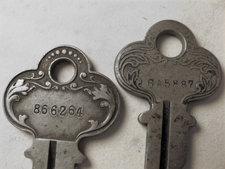 The superstructure of power that allows the government to clamp down on individual rights still stands, even after the rights have been restored. If you're looking for a quote upholding civil liberties and freedom in a time of desperate war, a better choice than Lincoln would be Supreme Court Justice Robert C. Grier, who presided over the circuit that heard the case of the West Chester "Jeffersonian's" publisher. He charged the jury that there was no justification for the seizure, and that the district attorney had no power to issue a writ ordering the seizure. The power to issue writs, he told them, belongs to the courts alone. While admitting neither Churchill nor Lincoln was perfect in his adherence to these principles, Andrew Sullivan nonetheless finds them superior to our current crop of leaders. If Lincoln could say this in the middle of the bloodiest conflict in American history, why cannot Bush and Blair say it today? He's right; the modern leaders lack the eloquence of their forebears. But Lincoln said a great many things during that conflict. © November 15, 2005 Douglas Harper Moe: "Say, what's a good word for scrutiny?" Shemp: "uh ... SCRUTINY!"